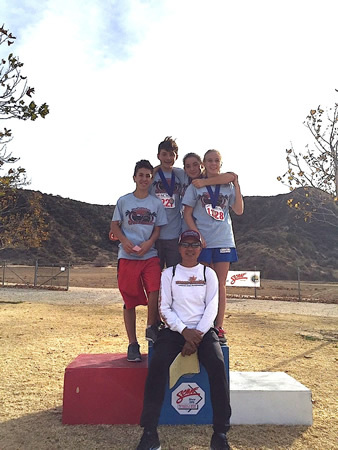 Laguna Beach cross country runners participated in the Southern California Municipal Athletic Federation Cross Country Championships at Central Park in Santa Clarita on Saturday, Dec. 5. Participants, from left, included Braydon Flores, placing seventh in Division 2; Max and Carmen O’Connor, both placing first in Division 3; and Kylie Beatty, first in Division 2. The team was coached by Fred Pichay.